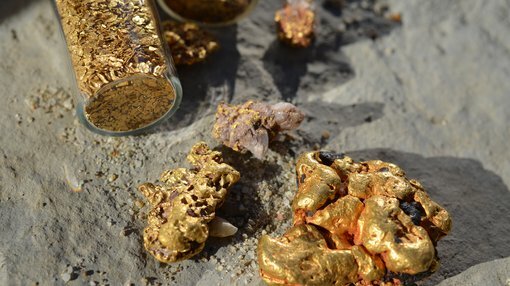 Kairos Minerals Limited (ASX:KAI) has announced an increase in Mineral Resources at its Pilbara Gold Project in the northwest of Western Australia, with recent drilling more than doubling the contained gold at Mount York from the previously reported 258,000 ounces to 643,000 ounces. 14.4 million tonnes at 1.3g/t gold for 643,000 ounces of contained gold, confirming that it is emerging as a significant new WA gold project. 11.3 million tonnes grading 1.34g/t gold for 486,000 ounces of contained gold, which represents a 290% increase in contained gold over the previous Resource estimate. It should be noted that this remains a speculative stock and investors should seek professional financial advice if considering this stock for their portfolio. 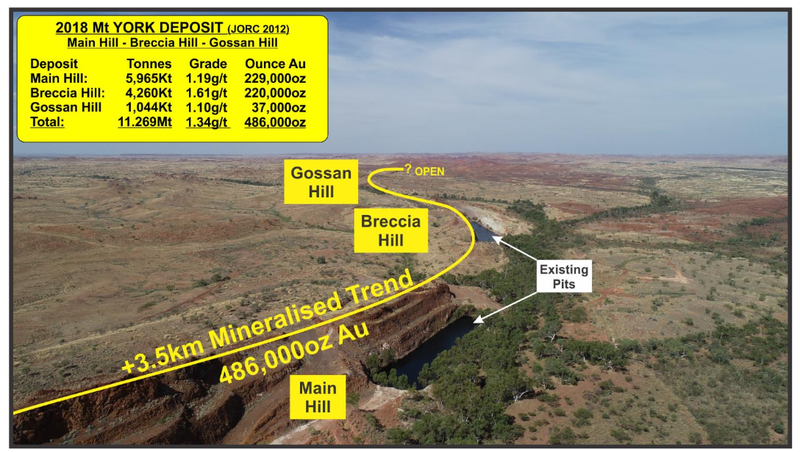 Main Hill-Breccia Hill-Gossan Hill is now confirmed as a single deposit that extends over 3.5km of strike, and is now described as the Mt York gold deposit moving forward. The significant increase stems largely from the reinterpretation of the deposit geology based on results from the highly successful extensional drilling program completed last year. Each of the deposits remain open both along strike and at depth. This provides outstanding opportunities to further increase the Resource and target higher-grade mineralisation at depth. A new major drilling program has commenced at Mt York to test the potential for further extensions to the mineralised zone and undertake additional in-fill drilling. 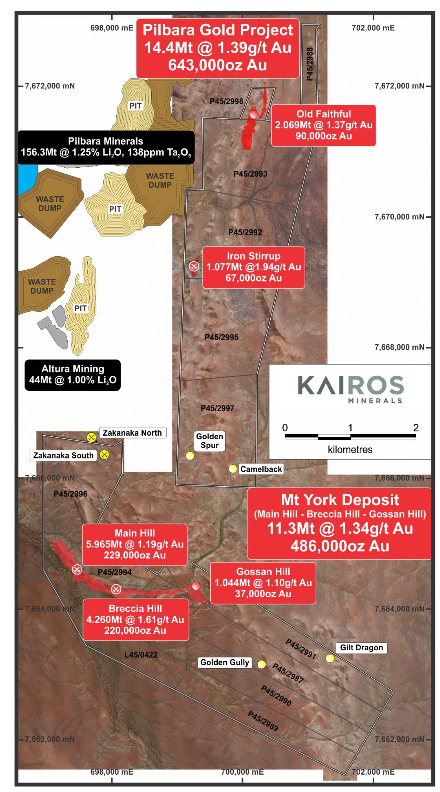 Kairos Executive Chairman Terry Topping said: “This is a great result which firmly cements Kairos’ position as a significant player in the Pilbara gold scene. The maiden drilling programs completed late last year have confirmed that the zone of BIF-hosted gold mineralisation at Mt York is continuous between the previously mined Breccia Hill and Main Hill shallow open pits, and extends for at least a further 1km to the east to Gossan Hill. 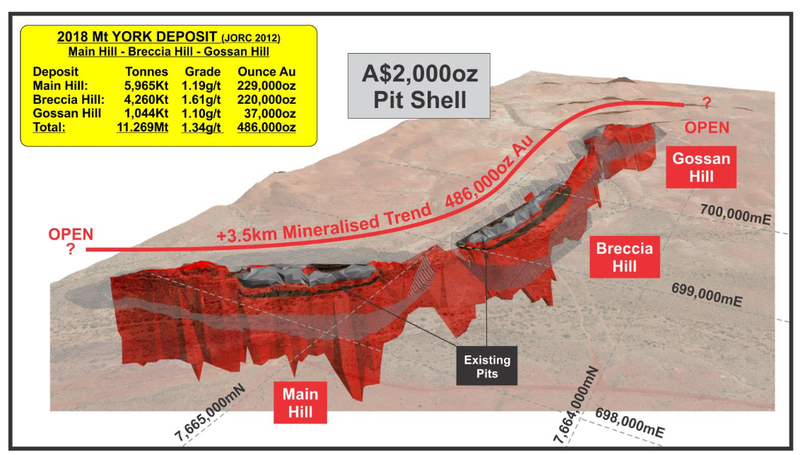 “The upgraded 486,000oz Resource at Mt York encompasses three contiguous deposits in Main Hill, Breccia Hill and Gossan Hill, extending over a strike length of 3.5km and to a depth of 150m. The Resource remains open in most directions, and there is clear potential to add further ounces both along strike and at depth – including the opportunity to target higher grade zones at depth. The gold project area is located 90 km south-east of Port Hedland is the West Pilbara of Western Australia. The company’s 100% owned project tenure is situated immediately east of Pilbara Minerals and Altura Mining’s lithium projects which are currently under construction, and includes 12 Prospecting Licences.